This fine antique George V sterling silver presentation trophy has a plain bell shaped vessel supported by three crossed riffles to a circular spreading base. The impressive supports forming the cup's pedestal are realistically modelled in the form of rifles, accented with a central suspended leaf wreath. The rifle handles terminate to a circular spreading weighted base* embellished with impressive chased decoration depicting a terrain mound incorporating leaf and floral motifs. This fine example of antique silverware is fitted to a circular painted wood plinth, encircled with a vacant silver inscription band; the band may be engraved with a personal inscription if so desired. This impressive English silver trophy was crafted in Chester by Herbert Edward Barker & Frank Ernest Barker of Barker Brothers. 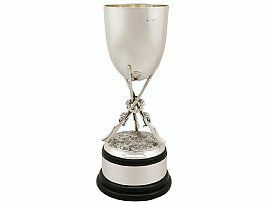 * The weighted base enables the trophy to stand securely on the plinth. This antique presentation piece is a very good gauge of silver, fine quality and in excellent condition. 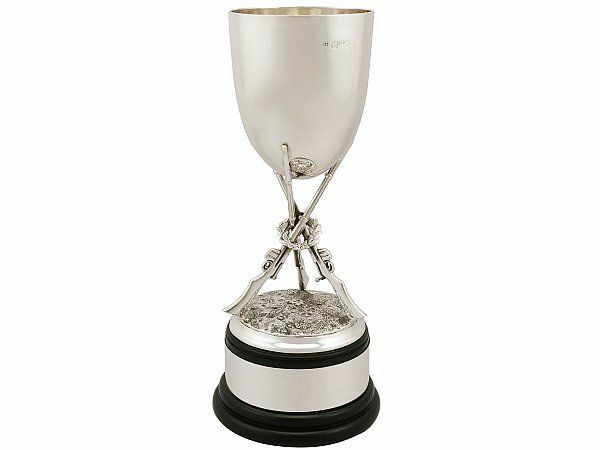 The English silver trophy has been professionally polished and is in presentation condition. Full hallmarks struck to the surface of the trophy vessel are all clear; the maker's mark and date letter are slightly rubbed but remain legible.